(M) Vintage Collectible Jouney "Los Angeles The Forum 1981" Tee! Heather Grey w/ Black Sleeves! 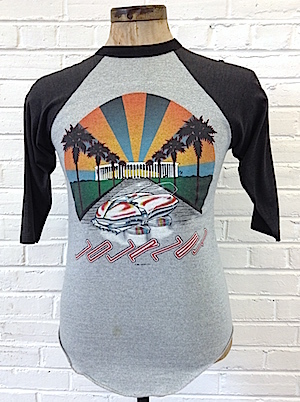 Home > Men's Vintage Shirts > T-Shirts > (M) Vintage Collectible Jouney "Los Angeles The Forum 1981" Tee! Heather Grey w/ Black Sleeves! 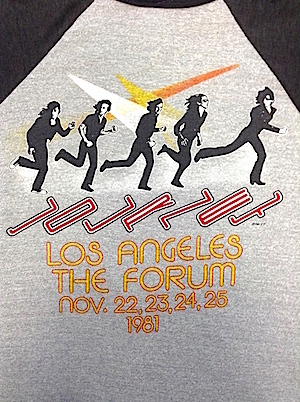 Super collectible Journey "Los Angeles, The Forum" tee shirt from 1981! 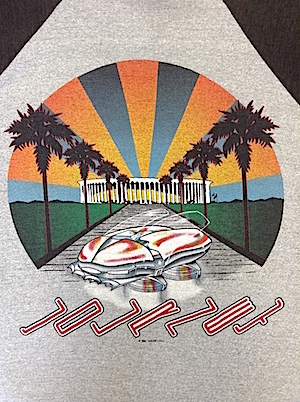 Front reads "Journey" and has an image of a beetle-looking hovercraft hovering in front of what is probably The Forum, with rays of light beaming out from the building, flanked by silhouettes of palm trees. The back reads "JOURNEY, LOS ANGELES, THE FORUM, NOV. 22, 23, 24, 25, 1981" and has the members of the band running above the text. Super soft and comfy. 50% poly/ 50% cotton. Condition: Good++. Has two 1/2" holes on the left shoulder, and tfour tiny holes on the right shoulder. Also has a 3/4" darkened spot near the center bottom of the front of the shirt. Priced as-is. Chest: measures 38" at rest. will stretch to 41". Although the tag is marked a L, this is better suited for a size MEDIUM.